The Dynamic Diamond Medium is in production since May 2012. It is one of the newest seamless models of the Diamond series. This model has the basics of the Dynamic Diamond Large. 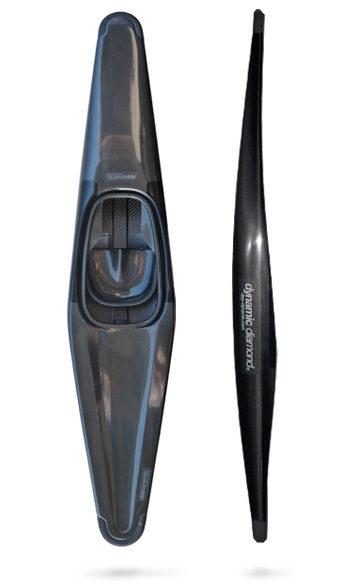 The difference is that the Dynamic Diamond Medium is more flat in the bottom, less volume and have an other paddler weigth. The characteristics are similar of the Dynamic Diamond Large. The Dynamic Diamond Medium is available with internal bumpers. The seat is adjustable 2 cm forward or backward. Special request for the seat can be given with the order. Bumpers are included, footrests are not included with the delivery. The Dynamic Diamond Medium is available with internal bumpers. Seat is adjustable 1 cm forward or backward. Special request for the seat can be given with the order. Bumpers are included, footrests are not included. Delivery period: according to current number of orders, see head 'News'.